OccuNomix Premium Cold Weather Coveralls Provide Warmth and Extra Visibility In Cold, Dark Work Environments. OccuNomix Premium Cold Weather Coveralls are constructed of flame-resistant polyester, 300 Denier with Thinsulate™ Insulation for added warmth and long lasting durability. Elastic adjustable suspenders with release buckle, elastic waist band, storm flap and quilted hood with a double position mouth cover. Reflective 3M® Scotchlite stripes provide extra visibility. Provides 2 front side pockets, 1 large chest pocket with flapped VELCRO®Brand closure, 1 flapped side deep cargo pocket, 1 side deep cargo pocket with phone pocket, 2 back pockets with VELCRO®Brand/zipper closure. Viral Penetration ASTM Method F 1671 Compliant. ASTM F 2732 Temperature Rating: -37.5° -4.3°F. Available style is Cold Weather Coverall. Available sizes are M, L, XL, 2X-Large, 3X-Large and 4X-Large. Color is Hi-Viz Yellow. 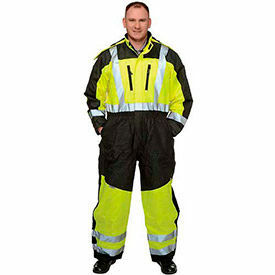 Refrigiwear Hi-Vis High Bib Overalls Are Used For Transportation Crews And Others In Low Visibility Areas And Cold Temperatures. 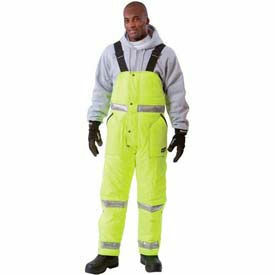 Refrigiwear Hi-Vis High Bib Overalls are made of a tear-resistant polyester outer shell with 11.25oz high-loft polyester fiberfill insulation for maximum warmth and long lasting durability. Reflective tape around torso and legs to allow high visibility. High bib front and back, adjustable heavy-duty 2" elastic suspenders and 3 insulated pockets. Available styles are High Visibility-Cold and HiVis Insulated Softsheel High Bib. Comfort Rating is -50°F. Regular, short and tall sizes available in S-5XL. Available colors are Black/Lime, Black/Orange, HiVis Lime Yellow, HiVis Lime Yellow with Reflective Tape, HiVis Orange and HiVis Orange with Reflective Tape.